Today I am going to share how to choose the right foundation for your skin . Foundation is a skin colored makeup applied on face and neck to create an even , uniform color complexion which cover flaws & scars and give a neutral look . Finding the best foundation for your skin can be a challenge as market is flooded with foundations from various brands ( both Indian & International brands). 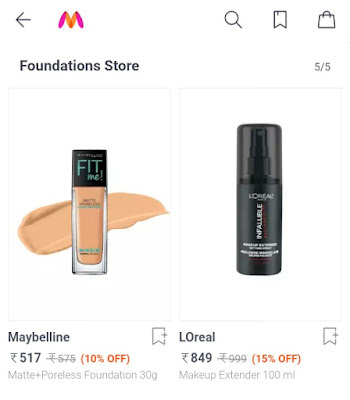 One can buy these foundations from some good online shopping Store like Myntra.com . So one needs to know bit about these foundations from various brands and also I will share some tips to choose the right foundation according to our skin type . It is necessary to know our skin type first before choosing any product for our face . Whether it’s Oily, Dry or Combination type . * For Oily skin choose Oil Free foundation or else it could lead to breakouts . Oily Skin beauties should stay away from heavy pancakes foundations as it can clog pores . They should go for a foundation with Salicylic acid and choose a foundation that is light weight . * For dry skin beauties Moisturizing foundations are perfect as they also moisturizes the skin . They should look for foundations containing Glycerin . * For Combination Skin Beauties Cream to powder based works well . * Mineral Foundations work well on all skin type , specially sensitive skin type . Before buying a foundation , check the ingredient list , if it contains anything which does not suits your skin then avoid buying that particular foundation . Pick a foundation with good SPF value , minimum SPF 15 as it can give protection from harmful sun rays . Some times we do not get the perfect shade what we are looking for . So one can add a little of moisturizer to heavy foundation and can apply it on face & neck and it works . So these are the ways by which one can choose right foundation for their skin . 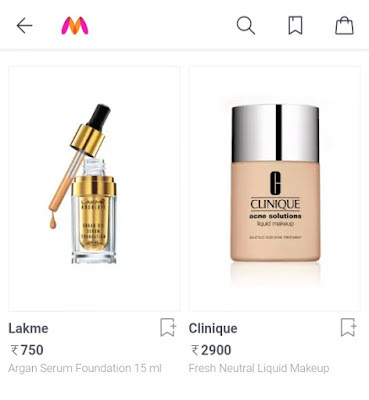 One can check online store like Myntra as they have good collection of foundations from various reputed brands . 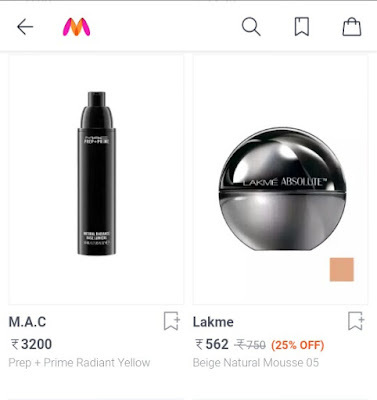 Myntra being one of the most famous and reputed online store in India , stocks good quality products from various brands . In the makeup & skin care section one can find products from various brands at a discounted price . One can also sort product by Price , Color or Discount . One can get upto 25% and above discount on foundations form various brands . Since my skin type is Oily when I looked for foundation for oily skin , I found some good options like products from Maybelline , Loreal & Faces . 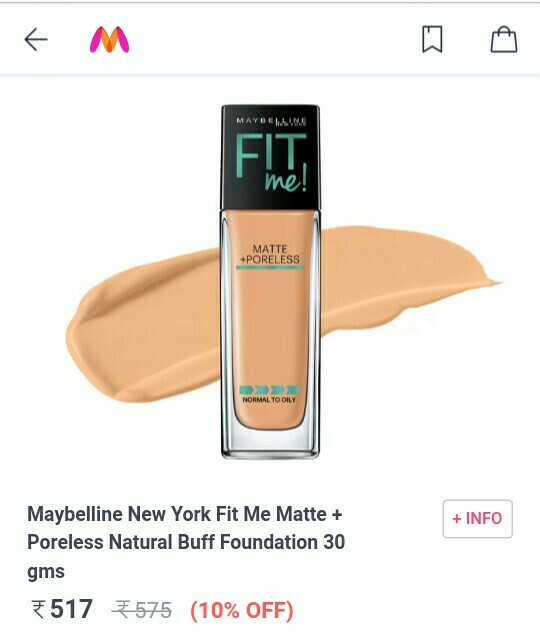 One of them being Maybelline Newyork Fit Me Matte + Poreless Natural Buff Foundation . After 10 % discount it’s at an affordable price of Rs 517 . It’s a light weight foundation which mattifies and refines pores and gives a Natural & Seamless finish. It’s Dermatologically tested and does not clogs pores so ideal for Oily Skin . So do check out the products at Myntra and with the above tips & tricks find your right shade and buy a good one for you .